Neural tissue is amongst the most difficult tissue to operate on, since it requires mastership of microsurgical techniques prior to acquiring robotic skills. This may represent a real triumph of telemanipulators, as they facilitate the microsurgical step. The goals of the training programs are to build facility with the robot and to provide an opportunity to simulate an in-vivo or “live” surgical procedure. Currently, there is not an adequate synthetic substitute or training model for Nerve surgery and Microneural Repair. As such, the surgeon interested in learning the skill of Robot assisted Nerve Repair requires training on animal and cadaver tissue. Clinical applications may include neurolysis of the Brachial Plexus, nerve decompression in the upper or lower extremity, neurectomy for treatment of spasticity, and translocation of neuromata. 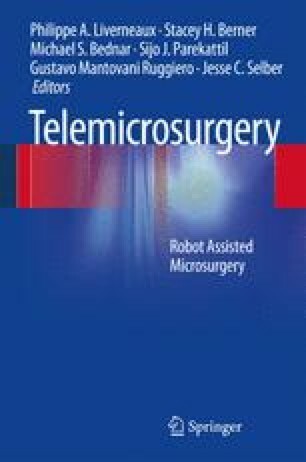 Advanced robotic training may utilize the endoscopic capabilities of the telemanipulator to perform minimally invasive nerve repair. Once facility has been achieved in the lab, transition to the clinical setting can be rewarding. Training protocols will continue to evolve and become standardized as this emerging discipline grows.